Looking for a quick and healthy dinner that warms the soul? This Roasted Chicken Sausage, Apples, Leeks and Parsnips hits the spot on a cold winter night. I was having one of those nights where I was starving, and looking aimlessly in the fridge. I wanted something that would be warm and cozy, but wouldn’t make me feel guilty for eating it. You never know how “experiment” dinners will turn out, but this one passed the test; in fact I could see this being a regular weekly meal. 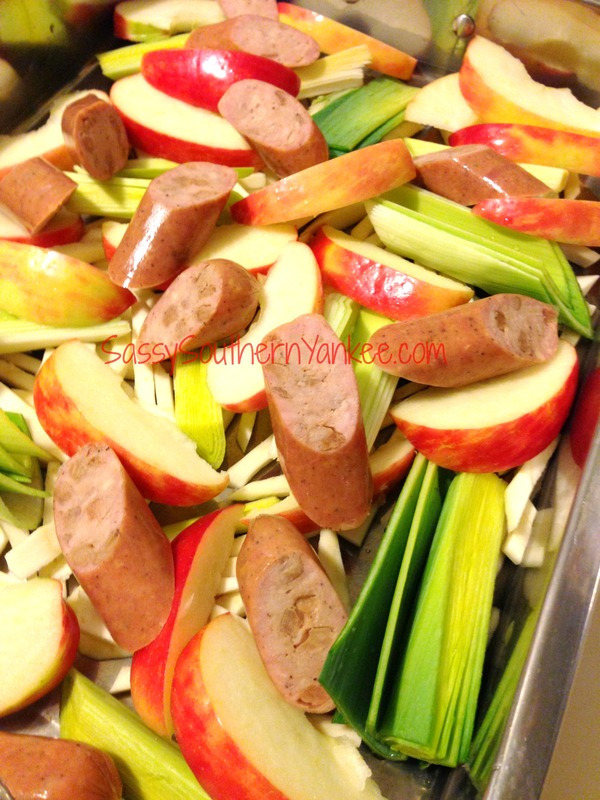 I hope you enjoy this Roasted Chicken Sausage, Apples, Leeks and Parsnips as much as we did! Spray a large baking pan or casserole dish with a bit of non-stick cooking spray. Peel and chop the parsnips into pieces (I did shoestrings). 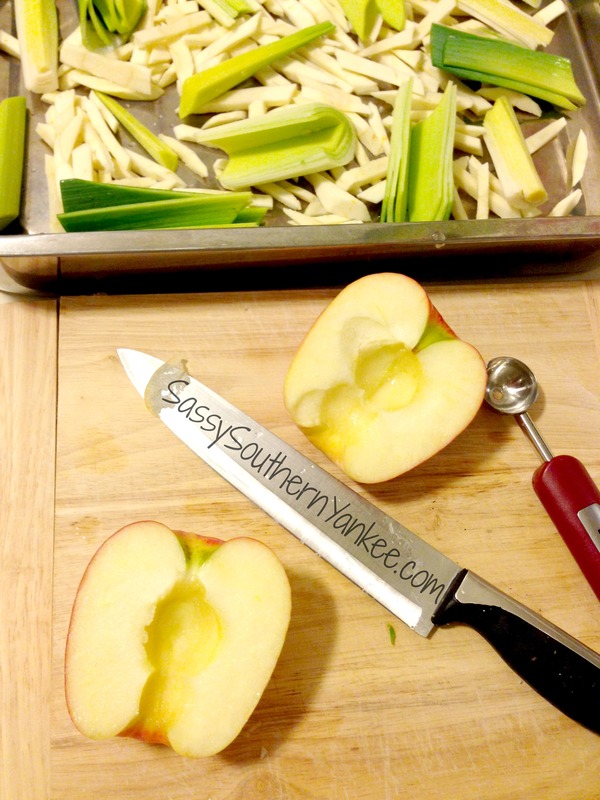 Clean and chop the leeks into half then into 4″ pieces; then core and slice the apples into 1/2 wedges. Add all of the produce into the pan. Toss all the produce with the olive oil and apple cider vinegar then bake in the oven for about 20 min. Remove from the oven, and toss the leek, apple, parsnip mixture. Add the cinnamon, chicken sausage then return to the oven to finish cooking approximately 15 min or until the apples and parsnips are tender. If you didn’t have chicken sausage you could really add whatever your favorite sausage is or even chicken breasts. When you have just about 5 min remaining add the maple syrup to help caramelize and pull all of the flavors together. Spray a large baking pan or casserole dish with a bit of non-stick cooking spray. Peel and chop the parsnips into pieces (I did shoestrings). Clean and chop the leeks into half then into 4" pieces; then core and slice the apples into ½ wedges. Add all of the produce into the pan. Toss all the produce with the olive oil and apple cider vinegar then bake in the oven for about 20 min. Remove from the oven, and toss the leek, apple, parsnip mixture. Add the cinnamon, chicken sausage then return to the oven to finish cooking approximately 15 min or until the apples and parsnips are tender. If you didn't have chicken sausage you could really add whatever your favorite sausage is or even chicken breasts. When you have just about 5 min remaining add the maple syrup to help caramelize and pull all of the flavors together. 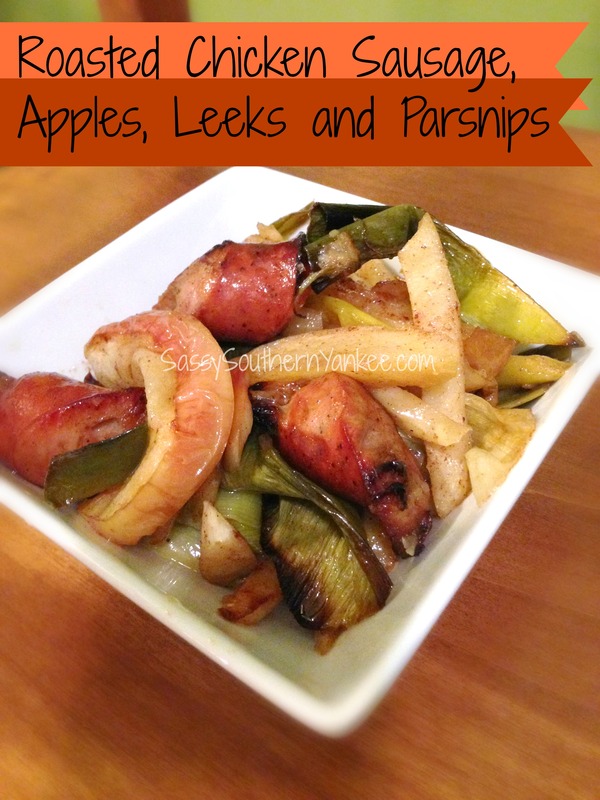 This entry was posted in Main Course and tagged Apples, Easy Roasted Chicken Sausage, Gluten Free on a Budget, Healthy Meals, Leeks and Parsnips, Quick Meals, sweet chicken sausage.